This is one of the most original steampunks I’ve ever read in my life, partly because this book is just so darn unique, and also because I don’t really read that much steampunk. Though the plot and the characters were great to read about, none of it could have been attention-grabbing without a decent writing style and setting. Luckily, this book had both. 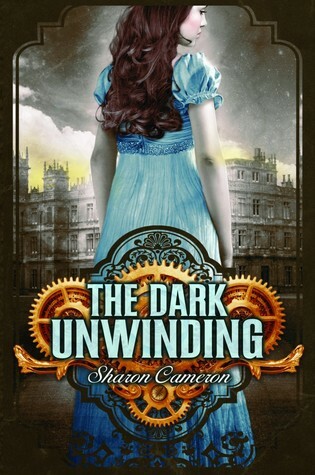 Sharon Cameron’s dark, self-depreciating writing drew me in almost at once, and the creepy, historical village setting was etched vividly into my mind whenever I read the book. This awesome combination of elements kept me reading this book almost non-stop until I finished it. In most books, the reader ends up admiring the main character almost at once, right? Well, not with this book. Almost until half the book – or at least for a third of it – I absolutely loathed Katharine. I liked that her circumstances put her in a position where life wasn’t easy, what with having an evil aunt and no inheritance and all, but I hated that she lacked the courage to do anything about her position, or at least show some sass to her aunt, the she-devil. Even worse than that though, was the fact that Katharine was willing to do anything to increase her chances of success in life, including send off her uncle to an asylum. She was so very selfish, and while that was the main aspect of her personality that I hated, it also acted to help her be more true to life. There was one person I hated much, much more than Katharine, and that would be Ben. I’m not sure whether readers were supposed to see him as a possible love interest and actually like him, but I can’t guarantee everyone that I did no such thing. From about the second or third time I met him, I hated him with all my heart, viewed him with suspicion in every circumstance, and put him on my enemy list. If that was what I was supposed to do, great. If it wasn’t, it doesn’t change how I felt. And boy am I glad I never harbored any feelings for that boy *shudder*. I think the author may have put it in her head to have me hate all her guy characters (besides the dear old, crazy uncle) on first sight. Well, maybe second sight. You see, my first sight of Lane was basically a hot piece of gorgeous standing in the doorway. However, that interpretation of him was ruined in the next second when he started staring down Katharine like he wanted her to disappear off the face of the Earth…which he probably did. So yeah, I hated Lane on second sight. I’d read the synopsis before reading the book, and was confounded as to how Katharine would ever come to love him. After all, Lane was nothing if not cruel and distant (and not in the way I seem to love). Unbelievably, a little further into the book, even I started falling for him. The ending of the novel wasn’t really a cliffhanger, though it sure felt like one. It was actually this weird combo of super-happy one minute and super-sad the next. Let me tell you, I didn’t appreciate that super-sad part one bit. I would love to go get the second book as soon as I go to the school library again, but too bad for me I guess, because I still haven’t started studying for finals:/ I guess I’ll have to wait ’till later to find out what’ll happen now.